1. 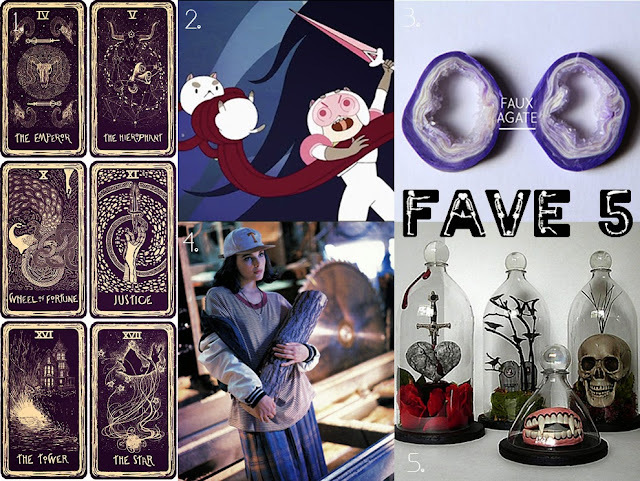 These tarot cards are so cool! It's called The Visions Project and there's a kickstarter for them here. 2. I love Bee and Puppycat! There's a minisode in two parts on Cartoon Hangover's YouTube and a kickstarter for a full series! I'm so excited to see more! 3. Fall for DIY has an amazing tutorial for faux agate. I have a lot of polymer clay just lying around and I really want to try this. 4. I'm a little bit in love with this awesome Twin Peaks themed fashion spread from a 1990 issue of Sassy magazine. 5. A cool Halloween DIY! These bell jars are made from soda bottles and still look creepy.